Swashbuckling tale of romance, betrayal, jealousy, banditry, murder, and court intrigue set in the 1660s, during the Restoration to the English throne of King Charles II. Donald is a young man dying of AIDS. His lover, James, asks his mother to go to Fayetteville, Arkansas and tell Donald's mother, who has been estranged from her son for years. Lord Lucius Vyne: There's not much time, Milord. The boat back to France will be waiting in the next cove. King Charles II: Lord Lucius, I am glad you persuaded me to risk coming out of exile in France to see for myself. I know now that the people are for me. They're sick of Cromwell and his Commonwealth! They want their Charles II. But you have made powerful enemies. When I am back on the throne, if you should need me, send me this. Get a grip you guys - this is not supposed to be great theatre. It's a fun, tongue-in-cheek adaptation of your typical bodice-ripper tale only rather better done than most (I'm thinking of the American equivalent offerings such as "Black Swan" (1942) or any of Errol Flynn's efforts). 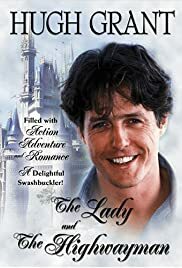 True - the transcription to DVD is about the worst I've ever seen outside of old kung-fu movies but just enjoy it for what it is - an early airing of Hugh Grant's talents with some great supporting actors. Everyone takes their part extremely well - especially Christopher Cazenove as the slimy Rudolph Vyne.